Georgia State football coach Bill Curry calls it “the miracle of team” — the ability to unite individuals from completely different backgrounds and mindsets under a common cause. Curry was speaking to a packed Parish Hall at St. Luke’s Episcopal Church, which hosted Atlanta Center for Self Sufficiency’s Annual Brunch. 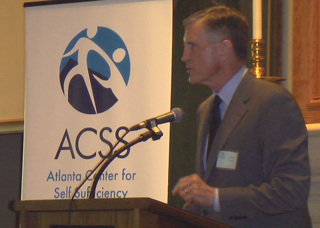 It was a year ago this month that Atlanta Enterprise Center, which grew out of an employment training ministry at St. Luke’s, merged with another independent non-profit, Samaritan House, to form ACSS. St. Luke’s remains an important and active partner in ACSS’s interfaith support system. The crowd in attendance included ACSS staff, volunteers, supporters and clients — folks from many different backgrounds, united under the common cause of breaking the cycle of homelessness.